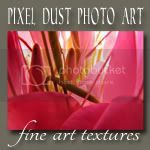 Pixel Dust Photo Art: I Dare You! Have I gone toooooo far with this week's optional challenge for Photo Art Friday? 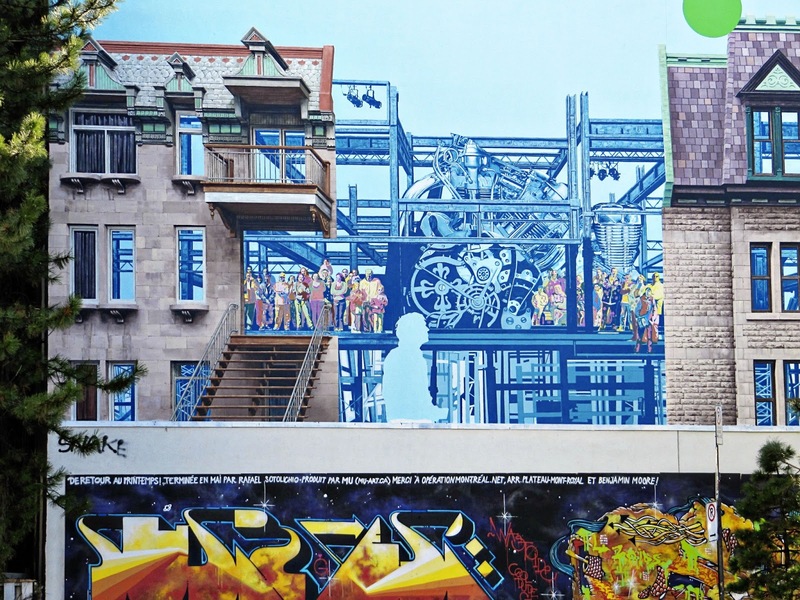 Have you been wondering how on earth to create an image that incorporates graffiti? Are you stuck in the pattern of only wanting to create beautiful images? What about venturing beyond your comfort zone to create something raw and gritty? 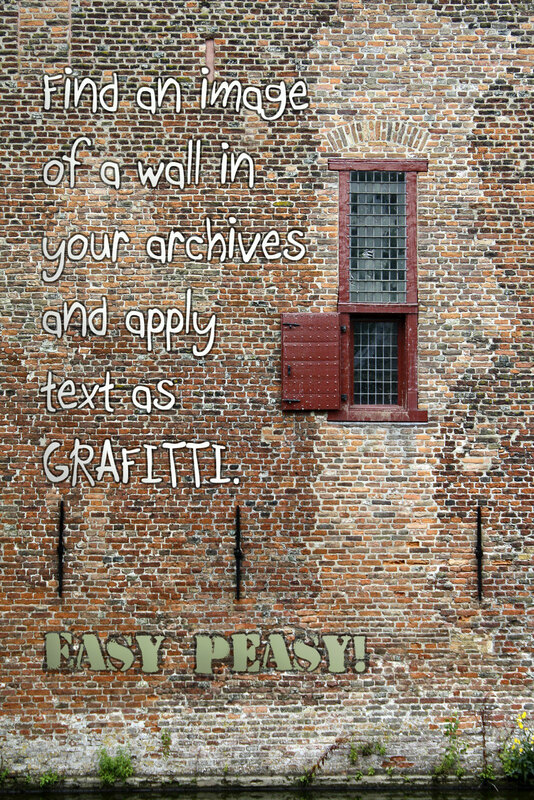 Well, this week's challenge can be as easy as finding a photograph of a wall, the side of a barn, a solid fence and applying some text to it. 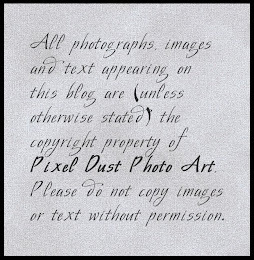 Then you work with the text to give it the look of a stencil, or spray paint. Here's an example I produced in five minutes. 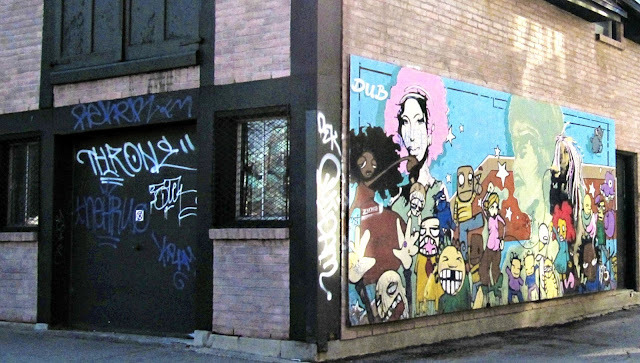 The graffiti image on the right was probably added to the wall with a permit from the City, while the graffiti on the black door on the left was most likely applied with a can of spray paint in the middle of the night. Perhaps you have a piece of photo art that you could give a poster or cartoon effect and apply it to a photograph that has a blank wall. Perhaps you just want to wildly scribble some letters or a message. Well - the choice is entirely up to you. This is another type of 'graffiti' photographed while stopped at a red light. This piece perplexed me when I saw it and it still perplexes me now. It is really a piece of urban art - a piece of trompe l'oeil (fool the eye). The piece on the bottom looks like it could be on the side of a truck, but the street sign pole on the bottom right reveals it is not on the road. I've no idea where the green circle fits into this. It makes me wonder if this whole piece was created on a huge canvas that was then applied to a wall. Are those real windows? Is that real sky? Is this real art? I say YES! to the last question. So ... will you join the optional challenge for this week's PAF of GRAFFITI? You can make it as simple or as complex as you please. Do you have a thought, a wish, an admonition, a scream! that you've been wanting to share with the world? Well here's your chance to take a walk on the wild side and 'virtually' spray paint your words on the side of a building. I dare you to play with graffiti - just this once!!! Have fun! 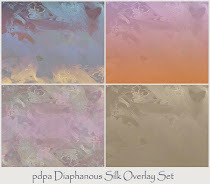 Labels: digital editing, digital graffiti, photo art, Photo Art Friday, what qualifies as art? I created mine yesterday and had great fun - and realised at the end how much I'd been wanting to shout my message ! Oh Bonnie, this really helps me - I was completely stumped. Thank you! I feel inspired now. I can't wait....I LOVE graffiti! However, I don't see much of the impressive kind since I live in a truly rural area. On our two visits to New York where our oldest son lives, I had a ball photographing the graffiti in Brooklyn's Williamsburg, Greenpoint, and Bushwick neighborhoods. When I read the PDPA challenge yesterday, I knew my only option here was to find a train! I had my husband drive me to the back of the plywood mill, where one can almost always find a section of cars waiting to be loaded. I found my graffiti and I had great fun with your textures last night. So I'm ready for Friday! Oh yes ... trains are a great idea, Evelyn!! Loved this post Bonnie, made me smile! 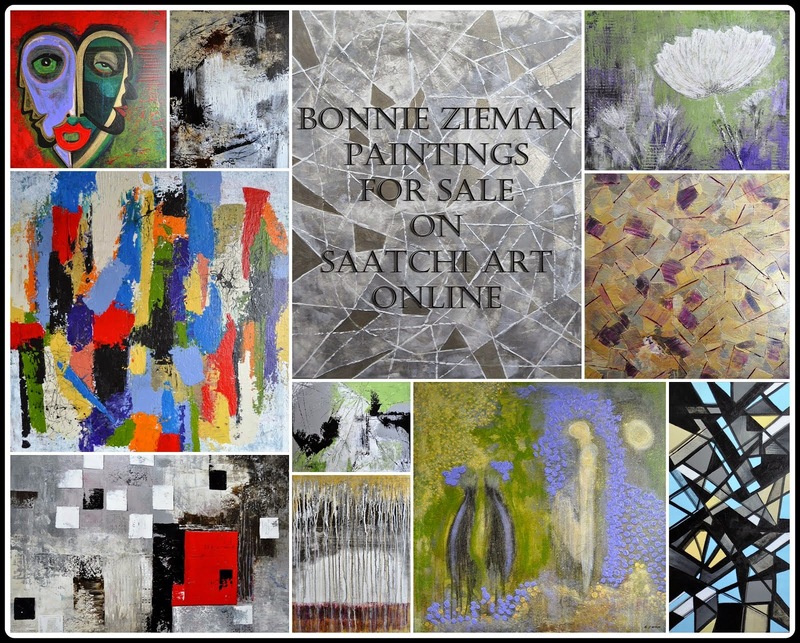 U R so funnie :) great sell, Bonnie! Delighted with the challenge. And delighted with your post. Oh Bonnie I just couldn't stop playing about with this challenge yesterday. I have so much graffiti now. I also wrote on my white wall just for fun but it is exactly what you wrote on yours! Photo Art Friday Rocks. shall I post it? I might just send it to you. You have not gone too far, Bonnie! I love the way you challenge me - I think I learn a lot from your prompts and your inspirational pictures and textures. I think we all love the challenges..I am learning a lot along the way. Great photo art...Bonnie! Okay -- the challenge is on -- I tell you I was having a bit of an issues with this but I remember taking a photo a while go from one the small town in AZ that had a side of a building covered with amazing graffiti art.. maybe I will use that if nothing else comes to my mind.. 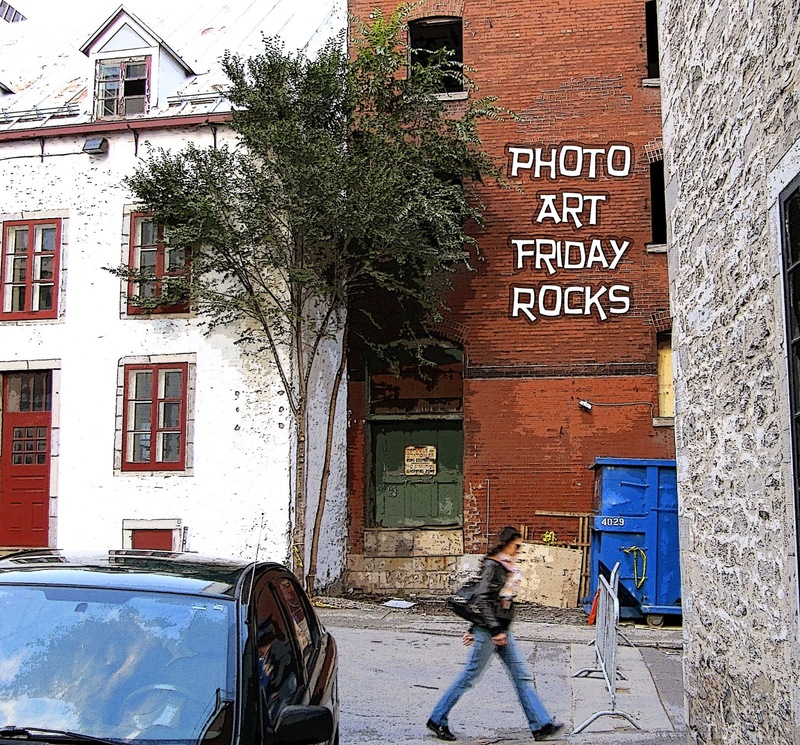 Thanks for the examples it has helped and Yes, indeed Friday Photo Art "Rocks".. wink! Bonnie, this is going to so fun! Out of our comfort zones, perhaps, but a challenge worthy of creating some unusual and fun art! Can't wait 'til Friday to see everyones contribution! WE will SEE won't we!